HomeHave Leftover Pretzels? Love Cookie Dough? 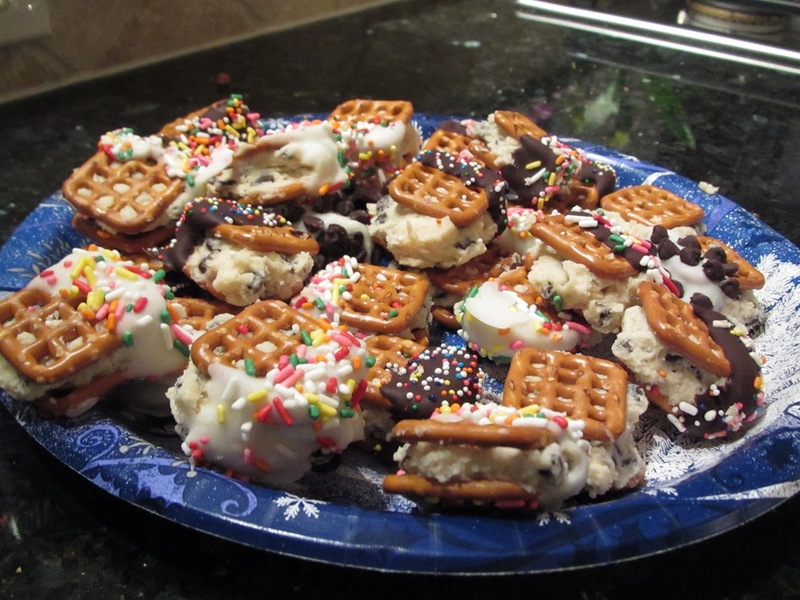 Have Leftover Pretzels? Love Cookie Dough? And since a friend found me a whole bag of circular pretzels, I don’t need them for hugs and kisses candies. I knew that I had seen a few pretzel sandwich recipes around the holidays and this one definitely caught my eye. Complete with cookie dough and sprinkles…how could it not? So yesterday afternoon, I woke up from my nap at 2pm, just as the snow started to fall. Instead of using my big mixer, I went with the handheld one for easy clean up. The ‘dough’ was super fluffy! Eggless cookie dough = PURE danger! I think I made my sandwiches a little heavy on the filling, but like I said, I really do love me some cookie dough! I put all of my sandwiches in the freezer, licked the leftovers straight from the bowl, and went upstairs to get ready for the night. A little over 30 minutes later, I got to the fun and colorful portion! I melted some white and dark chocolate and used an assortment of decorations including sprinkles, chocolate chips, and Andes peppermint chips. All of the pretzels turned out so bright and adorable! And they taste unbelievably sweet with the creamy cookie dough center and a crunchy pretzel ‘crust’. It’s fun to have some bright colors in the house. Looking for More Cookie Dough Recipes to Love?! Cookie Dough Nut Butter *Oh She Glows! 1. To make the cookie dough: in the bowl of a stand mixer, beat together butter and brown sugar until light and fluffy, about 2-3 minutes. Mix in flour, powdered sugar, and salt. Slowly add milk and vanilla extract and beat until fluffy, about 2 minutes. Stir in the mini chocolate chips. Roll the cookie dough into little balls, about a teaspoon each. Sandwich between two pretzels and put on a plate or cookie sheet. Freeze the pretzel bites for 30 minutes. Do you like Cookie Dough? What is your favorite recipe? I love cookie dough and will never forget calling my mom in college to ask for the cookie dough recipe on the back of the nestle package. My roommates and I had no chocolate chips and needed a cookie dough fix! Those cookie dough pretzel bites look awesome! Love the sprinkles addition :)! Thanks! They are great tasting and super cute. Plus, they were really fun to make! So true! I am the exact same way. The best part about these is that I finished them right before heading out the door and they were ALL gone before I left the party, so no temptation around. Now I am on to healthier, veggie filled, recipes! I’m drooling on my keyboard! Those look ridiculously awesome! Ha ha! I think they are from the Cookie Dough Lover’s cookbook which has the most amazing recipes! Man, I love my afternoon naps. They just come back to bite me on Sunday nights! Those pretzel sandwiches look awesome!! I didn’t get in a nap yesterday, so I was able to crash Sunday night. but I do love my weekend naps! My favorite cookie dough has always been snickerdoodle dough (also no eggs) but yours sounds awesome-I will have to try it. That is sometime when my willpower is at 100%-I could see me eating enough of those to make me not feel very well! I set myself up for success by bringing them to a party and leaving them there, so if you plan ahead, it is worth it! I love snickerdoodles! YUM! 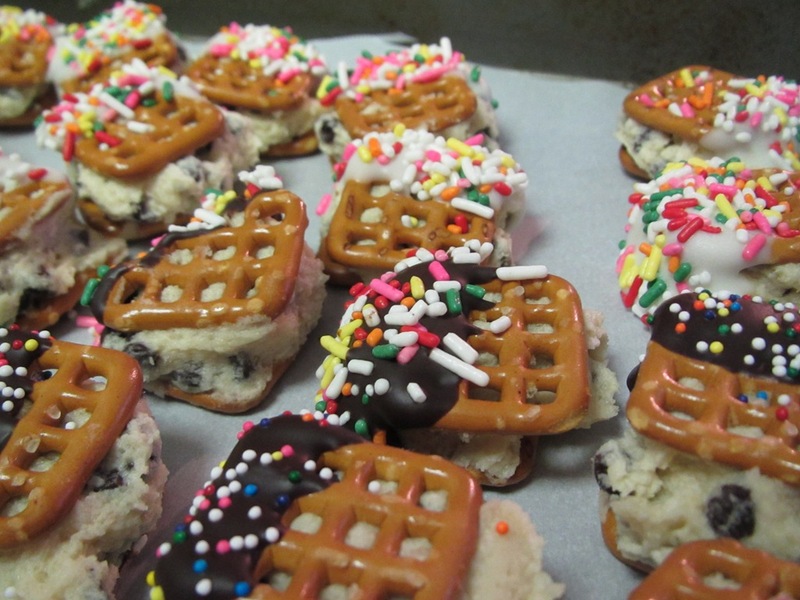 Cookie Dough pretzel bites!!? For real!? those look FANTASTIC! They are! One of the best recipes of the year (but the year is still early) Ha h! I agree! Save them for when you can take them out of the house. Cheers to cutting back on sugar. I have done better and am planning to do GREAT this week! I love those pretzles with the chocolate and hershey kisses 🙂 I love that these are bite-sized too! Me too! I am alread collecting ingredients to make a Valentine’s batch for my coworkers next month! OH MY GOSH!! This looks AMAZING!! 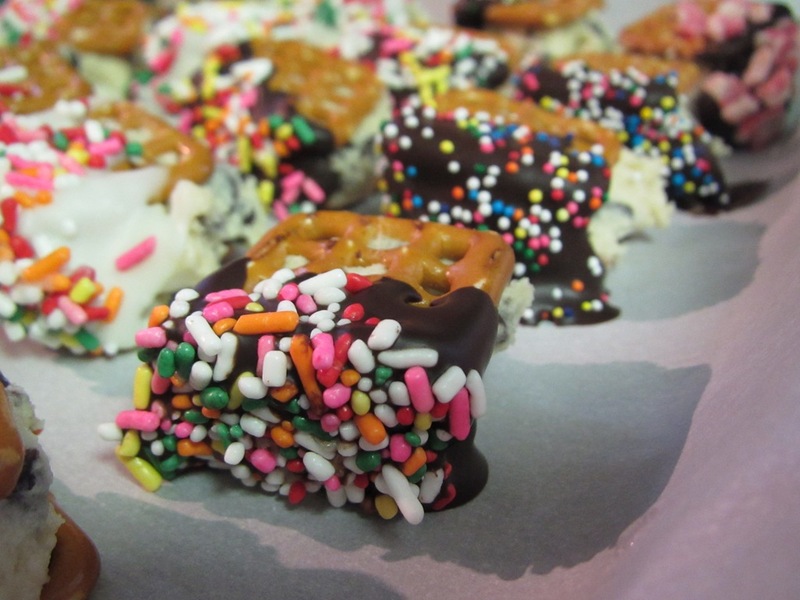 What a genius idea to make these with the pretzels. I LOVE cookie dough and I LOVE a vegan raw cookie dough recipe I found a while back on pinterest. It’s super quick and easy, and tastes amazing. Yes, I saw this on your blog and my mouth was watering immediately! So good to find another cookie dough girl! I almost dove right into the bowl of cookie dough. So good! They definitely need a share strategy because they are pretty dangerous : ) Thanks for the comment!